Do you live with a flinger? You know the type: short, furry, and seems to make a job of getting as much litter out of the litter box and onto your floor as possible. Why in the world to some cats fling so much litter out of their boxes? When cats use the litter box, they usually poke their noses in and sniff around first, then climb in and eliminate, then turn around and cover the results with litter. If they've eliminated close to the edge of the box or if the sides are shallow, the covering portion of the event might result in litter getting flung out of the box. 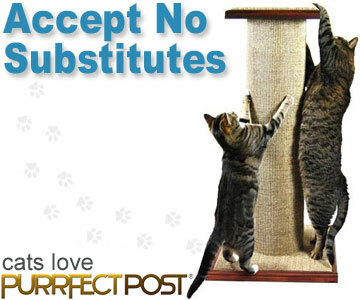 If this is the case for your cat, he might need a bigger litter box, and he definitely needs one with higher sides. Be sure to use the same litter in the new box that your cat is used to, and keep the old box nearby until you're sure he's using the new one. If your cat is flinging litter before he settles down to eliminate, it may be that he's trying to make a cleaner spot for himself. If this is the case, you need to reevaluate your litter box cleaning procedure and tweak it as necessary. Sometimes litter ends up all over the house not because your cat is flinging it there but because it's sticking to his paws and making its way out that way. If this is the case in your situation, try a good litter mat. We like the Cats Rule Litter Mat, which has great grooves and ridges that help clean off your cat's paws as he steps out of the litter box, decreasing the amount of litter that makes its way around your house. Remember, just because your cat was once a flinger doesn't mean that he always will be. Use the tips above to try to keep the litter where it belongs: in the litter box.